Eleanor Martin m. 30 May 1731 Benjamin Darling (b. 7 Jul 1711, d. 12 Jun 1777; fourteen children: Eleanor, Ruth, Benjamin, Henry, Henry, Thomas, Joanna, James, Henry, John, Joseph, Joseph, John, and Henry Darling; d. ? I have a special fondness for this family as they were one of the first I was able to trace from my grandfather's grandfather, Thomas Martin Harris. Thomas and Eleanor Knott had two children, Sarah and Knott, who are our direct ancestors, and Knott had a son, Thomas, who also gave us two. 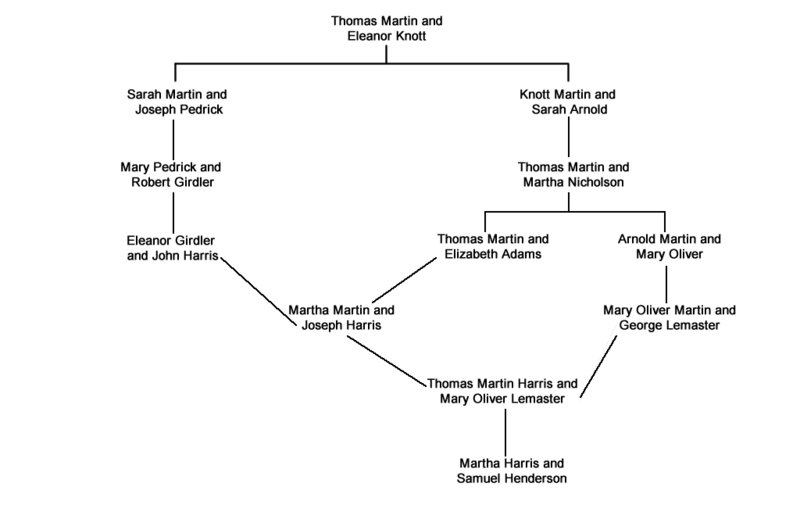 Because of the multitudes of Martins in the Tree, ALL of Martha Harris Henderson's four grandparents can trace their ancestry back to Thomas and Eleanor Knott Martin. Our first Thomas was the son of John Martin and Sarah Northey, who was the daughter of John Northey, an early settler of Marblehead, and his wife Dorothy (surname unknown). The will of John Northey, Sr. of Marblehead, dated 8 Sep 1688, mentions his children John Northey, Sarah Martin, and Dorothy Picket. He also mentions Sarah's sons John, Peter, Samuel, Robert, and Thomas Martin, and Dorothy's son John Picket. Witnesses Erasmus James, Nathaniel Norden, and William Waters, probate 30 Jun 1691. Historical Collections of the Essex Institute, Volume 5 (1863) Essex Institute, p. 46. Eleanor Knott was descended from one of the first settlers in Marblehead, John Devereux, through her mother Hannah Devereux, who married as one of her three husbands Richard Knott, the father of Eleanor. He was a surgeon in King Philip's War and a Marblehead entrepreneur, and died when Eleanor was just short of a year old. She would not have remembered him, but she honored him by giving his surname to her first-born son, and there have been generations of subsequent Knotts through today. After his death, Eleanor grew up with her mother and her third husband Joseph Swett along with her half sibling Joseph Swett, Jr. Two of her half siblings Margaret and Anna Greenfield married not long after she was born, and their children would have been closer to her age. She had three full siblings when Richard Knott died, but they have not been traced and possibly died in the next few years. The names "Thomas" (for this Thomas Martin), "Hannah" (Hannah Devereux), "Sarah" (Sarah Northey and later Sarah Arnold), "Arnold" for Sarah Arnold. and "Eleanor" (Eleanor Knott) were also common names given to the descendants. Thomas Martin was described as a "shoreman" in the newspaper advertisement regarding the administration of his estate. Several of later generations of Thomas, Knott, and Arnold Martins were designated as "captains". From Perley's Marblehead in 1700, we also know that Thomas and Eleanor were given (or had "conveyed" to them) the home her mother Hannah Devereux Swett and her third husband owned. Thomas and Eleanor had at least six children, the first four of whom were all baptized on the same day, so we do not have all their exact dates of birth. Sarah Martin Pederick has a death record which gives her age at death, so I was able to determine that she was born in 1705. A newspaper clipping about the longevity of his own children indicates that Knott lived to be 88 years old. He died in 1796, which means he was born about 1708. That same article also called him "Dr." Knott Martin, but what the "Dr." designates is unknown. Eleanor herself died on July 4, 1759 and was buried at Old Burial Hill, where her tombstone can still be found. Hannah and her husband, Job Burnham, left Marblehead in 1732 after their fifth child was born. It's very possible they removed that year to Scarborough, Maine where his parents resided, although a baptismal record for their daughter Eleanor cannot be found in either Marblehead or Scarborough. They were there for sure in 1742 when they became members of the First Congregational Church. Job's father signed a revised will in 1756 leaving the bulk of his estate to his deceased son's wife and children and only £5 to Job, Jr. after he died later that year. Job disputed the will on the grounds that his father had been too infirm and his mind too impaired to make a will. The testimony offered in the case, which was won by Job, reveals a few facts about their lives. His aged parents resided with his family, and testimony revealed that they had thought Hannah to be kind to them as if "she had been born of their body;" that "they were a great deal of trouble to the family" but Job and Hannah were patient with them; and that he had often told a neighbor that he was mistreated and that Job Jr,. once told him he'd wished he had not a drop of his father's blood. Testimony was given that the father's mind at the end of his life was very diminished. We also learned that Job. Jr. lost a schooner close to Marblehead that was partly owned by his father, and that he was injured in the accident so that he could not return to Scarborough until after his father's death. Administration of the estate, which included a farm at Blue Point and 100 additional acres, was granted to Job, Jr. and divided among ALL the heirs. Although it's not stated, I suspect that Job and Hannah moved to Scarborough to help care for his aging parents. They remained there for the rest of their lives. Records for their children are scarce, but those that can be found indicate they too settled in Maine, although their daughter Abigail married and lived her life in Marblehead with her husband Jonathan Glover, the brother of General John Glover who married Hannah Gale, the daughter of our direct ancestors John and Susannah Dennis Gale. Sarah Martin married into the Pedrick family. She and her husband, Joseph are our direct ancestors and have their own family group page. The Pedricks arrived well off in the New World and increased their wealth in maritime endeavors until the Revolutionary War, which took most of their vessels and their wealth. Joseph and Sarah Pedrick's daughter Sarah married Nicholas Broughton, a Revolutionary War hero in Marblehead. Their son Captain John Pedrick owned a large fleet of 25 vessels and a mansion built in 1756 and expanded in 1770 to resemble that of Jeremiah Lee. John was the grandfather of U.S. Supreme Court Justice Joseph Story, son of Tea Party patriot and physician Dr. Elisha Story and his vibrant wife Mehitable Pedrick. I encourage you to read the stories about various individuals involved in the Revolution at this part of the site. Eleanor and her husband Benjamin Darling lived their lives in Marblehead where they had many children, many of whom died young. Unfortunately, I could not find information about them other than baptism and marriage dates for some of the children. Knott and Sarah Arnold Martin, who are our direct ancestors, were the grandparents of two distinguished sea captains who were also our direct ancestors. Sarah Arnold is thought by some to be the aunt or another relation of Benedict Arnold, but I've been unable to discover that connection. I haven't been able to discover anything about her, but her surname "Arnold" was given to several boys in subsequent generations. Sarah died, and 35 years after his first marriage, Knott married Ann Jackson, the widow of Benjamin Girdler, with two teenage kids of her own. Knott and Sarah had two more. A newspaper article about Knott and the longevity of his family was published after his death. It provided the names and ages of most of his children. Knott was 88 when he died. Some of his siblings also achieved a good age, and his son Thomas was 96 when he died. The article refers to him as Dr. Knott Martin, but I can find no information about his means of livelihood. Knott and Sarah are our direct ancestors and have their own family group page. Thomas's first wife, Mary Gourden (Gorden) died at age 20 a week before the death of their three-month-old son Richard. Thomas had a large family with his second wife, Sarah Goodwin. They relocated to Bristol, Maine after the births of all their children. His later daughters, Sarah, Eleanor, Rachel, Nancy, and probably Elizabeth, all married men in Maine, so he must have been there by at least 1777 when the first, Sarah, was married there. Ruth lived to the ripe old age of 98. She and her husband Captain John Barker had several children, and many of them survived her. Captain Barker's mother was Ruth Pitman, the granddaughter of our ancestor Mark who was killed at the Battle of Bloody Brook. One Ancestry user records that John was lost at sea in 1767, but I've been unable to find any information about when and where he died. The genealogical records are our best proof of relationship for our direct ancestors in this family. The research on this family is basically complete. A later search might discover new information from records not yet found.